Marketing your business is a necessity for growing your business and to stay in business. If you fail to grab your share of the marketplace, your competitors will box you out. Business usually face two dilemmas: money and time. We covered the different ways you can pay for marketing here. In this post, we want to discuss the time dilemma. Six Tips To Save Time Marketing Your Business. Set Goals – Outline goals, both short- and long-term, so you can better determine what needs to be done. By understanding where you want to be, you can outline the steps you need to take to reach your destination. Create a Marketing Calendar – Once you know your next stps, a marketing calendar will help you know when tasks need to be done and who needs to complete them. You can think of it as a blueprint providing a structure for all your marketing activities.Use Templates – Templates are great for any forms content you will create on a regular basis. Blogs, videos, and webinars are examples of content that can benefit from a template. Repurpose Old Content – You do not always have to reinvent the wheel. Much of the content you create can either be republished or repurposed. Evergreen or seasonal content are great examples of content which you can either republish or repurpose. Use Automation Tools – Automation tools are a must. Whether it is delivering content, responding to inquiries, or collecting customer info, you must find ways to ease your burden by letting the advances in technology assist you. Do Not Let Perfect Be the Enemy of the Good – This is a big one, and one we know from experience. It is easy to think you have to be perfect. While you do want to deliver quality, remember that nothing is ever perfect. Make sure the basics like spelling, grammar, and branding are on point and everything else will take care of itself. It also helps to remember that the more you develop content, the better you will get, so practice, not perfection, is what you need. BONUS TIP: Don’t be afraid to ask for help! If you feel overwhelmed, delegate to someone you can trust, or hire someone internally. You can also contact external help, like Beacon Marketing, to assist you. No matter how you do it, getting help is sometimes necessary so don’t be afraid to ask! Looking to save time marketing your business? 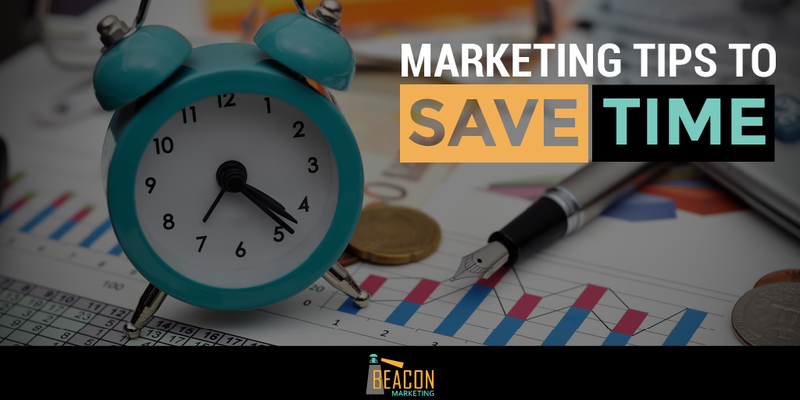 Beacon Marketing provides effective and efficient solutions to your marketing needs. Schedule a FREE 60 minute consultation today! It is possible to be successful while you market your business. The key is to have a plan and look for ways to work more effective and efficiently. The above tips are provide a great start!